My friend Larry insists that this image (Reuters, via Haaretz) must be captioned, and as usual, he's right. The sexiest man alive speaks at a press conference promoting a friendly football match, accompanied by actor Sean Connery. 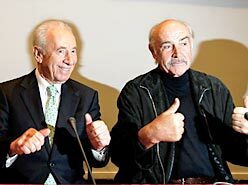 Sean Connery and Shimon Peres audition for roles in an upcoming HBO biopic about Siskell and Ebert. Peres: "I thought you were very funny in those Saturday Night Live game show routines." Double-Oh-Seven and Double-Oh-Zero appear together to promote a football match. The two have much in common, each having been elected Prime Minister the same number of times. Shimon Peres denies peeking at neighbor Sean Connery's answer as doctors assess the mental state of the two aging men with the question "how much is one plus one is?" The two men, each formerly licensed to kill in his own right, enjoy a relaxing round of "Eency Weency Spider" before the 10am vanilla pudding tray arrives. Shimon Peres smirks as Sean Connery considers how to answer his question "Have you stopped beating your wife yet?" It's smiles and thumbs up all around as producers announced the cast for next year's upcoming remake of Bill and Ted's Excellent Adventures. Sean Connery struggles to conceal his scowl as Shimon Peres confides, "You know, after I lost to that guy with the mustache, I told them -- I used your famous line here -- I said to them, 'Ahll be Bahck.' Isn't that fabulous?" // posted by AbbaGav @ 11/29/2005 05:43:00 PM | | | Permalink | EmailThis! Poor Preppy Prisoners, Snatched From Chess Club?